Zenmax gold balans and response training gives older people the chance to be more actively involved in society, increasing their self-confidence and to manifest themselves stronger and more visible. Coordination, flexibility, balance, strength and endurance exercises are an important part of the training program. During the Zenmax gold training, you will learn to deal with situations of uncertainty, anxiety, and aggression. You will learn effective selfdefense exercises from the so-called more gentle martial art forms, with an emphasis on posture, voice, and appearance. And do not underestimate the positive effects of good physical exercise, developing new social skills and having fun together the other group members. • add quality to the years to come, through practical longevity tips and exercises. • recognize unsafe situations and to deal with them in a safe and responsible way. 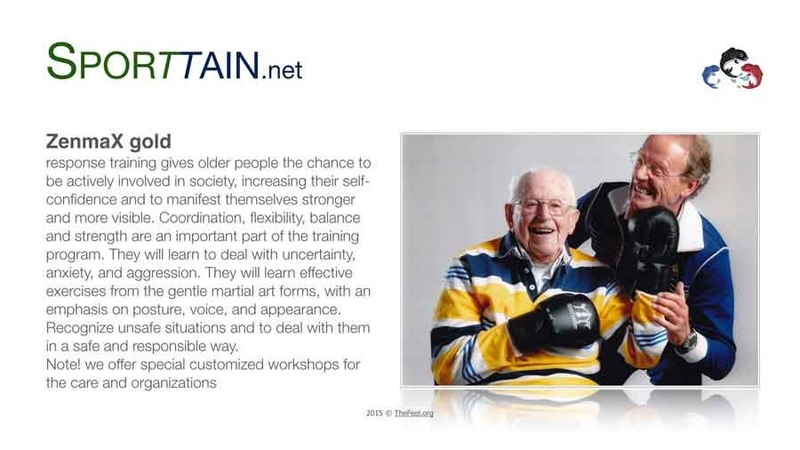 In addition to the Zenmax gold, we offer the opportunity to take part in various martial arts activities that specifically aim at the elderly.